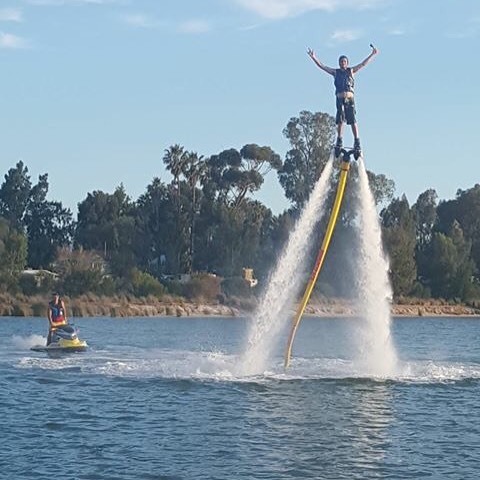 Water sports have taken on a new evolution with the introduction of jet packing and flyboarding. Skiing or wake boarding no longer have the same level of excitement once you have experienced this new craze. Thanks to1800jetpacks we were able to give the flyboards ago for ourselves. 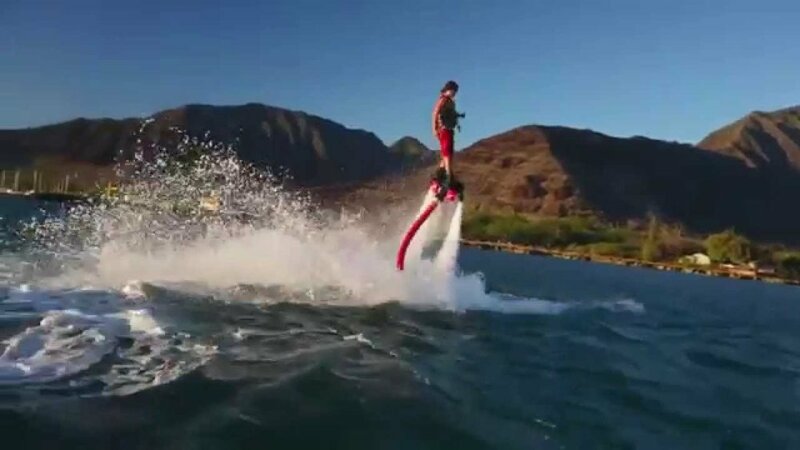 A flyboard (or jetboard) is a water powered board that is strapped onto your feet almost like a snowboard. With the force of the water you are propelled high (for some) into the air, steering with simple movements of your feet with a lot of balance. The other option is you can dive in and out of the water like a dolphin. The flyboard is linked to a near by jet ski where an instructor is able to give you directions through a walkie talkie linked directly to a speaker in your helmet. They were able to adapt to our different skill levels and coach both of us how to confidently control the board. It's fair to say one of us was more skilled than the other by soaring meters out of the water. The other stayed only a small yet safer distance from the water. I have always loved the water, probably because I grew up along the Murray River and a lot of our summer activities revolved around the River. I did have a few friends with boats but only had limited experience with skiing or wake boarding. The idea for Jet boarding was all Lawson’s. It’s been something he has wanted to try for ever. I was planning on giving it ago, because I like to try things at least once, however I was basically just tagging along for him. There was a group finishing up just as we arrived and watching them started to make me feel nervous. It looked a lot harder than I thought and to be honest the lady prior didn’t appear to be having that much fun either (granted she was approx 50+). As we started to dress in our life jackets, that’s when the fear took over. I had it in my mind that I didn’t want to do it. I decided to pull out and just observe Lawson. Of course he went out and nailed it. I convinced myself it was because he was a skateboarder and it was a similar skill. Even more reason why I reassured myself I had made the right decision to pull out. I am dangerous on a skateboard. I have no balance at all and have nearly injured myself and others around me. As I sat watching Lawson, the other instructors started chatting to me and trying to convince me it would be fine. I have always thought of myself as a person who would try anything and I realized if I left without even having a brief attempt I would regret it. While completely freaking out I let them start to strap the board to my feet. Once out in the water it was pretty much a matter of here goes nothing. The directions the instructor was feeding me through my helmet were clear and easier than I thought to follow. When I realized I was actually able to do the things I was asked I become a lot more confident. The last instruction I heard was “now bring your legs below you” and with that one move I was propelled so high out of the water. I felt like I was soaring and I was actually loving every minute of it. It was only after I’d finished and was looking at the photos that I realized I was probably only a meter out of the water but I didn’t care. It was the sense of personal achievement that I loved the most. Ever since they created the water jet packs I have been dying to get my hands on one and give it a try. 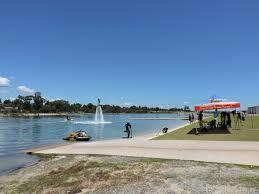 I finally got that chance in Perth at champion lakes. Cat was confident the entire car trip until we pulled up and she saw the jet packs in person. For some reason it freaked her out and it’s the first time I’ve seen her not want to give something a go, which isn’t like Cat at all, so I know she was serious. That didn’t stop me from trying to get her to change her mind. I went first and instead of riding the jet pack I opted for the fly board. It was a little tricky at first but the guys at 1800Jetpacks, who follow along on Jet Skis, are communicating with you through a special helmet. They are able to coach you as you go. I’ve gotta be honest it was more tiring than I was expecting but once I got the hang of it, it was invigorating. I had complete control of where I was going, moving around, spinning and turning. It is such an incredible feeling and is the closest thing to a hover board but more extreme. I really didn’t want Cat to miss out on such a fun life experience and was sad that she wasn’t going to. I headed back into the shore where she was all geared up ready to go, still looking as white as a ghost (whiter than we both already are) but she was ready to take that leap and give it a try. I’ll tell you this, I’ve never been more proud. She overcame what was clearly a very big fear and still gave it a crack anyway. That’s what I love about her. She is willing to give anything a go. I think it was more the fear of the unknown and thinking she might drown but when you are in the water horizontally it just pushes you along and you feel like a mermaid or dolphin. After a couple of falls Cat finally got up and had a great time. I can’t give this a higher recommendation. If you get a chance go out and have a shot, it is so much fun. Also I found out just recently, Jet Pack adventures were able to get a lovely young wheel chair bound girl onto the Jet pack and she had a great time. If she can do it and Cat can also overcome the fear, any one can. It was one of the best days we had in Perth.